Mix all dry ingredients together then beat the eggs with buttermilk, oil and butterscotch flavor in together and continue beating for 1 minute. 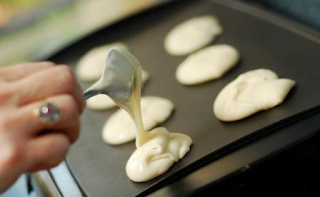 Pour batter using mixing spoon or ladle onto hot greased skillet or frying pan and cook until top is full of tiny bubbles and the underside is brown. These are a delicious twist to the ordinary pancake. Mmmmm!! If you don't need to make so much just halve the recipe or once you have mixed it keep the leftovers in the fridge in an airtight container for another batch tomorrow or within 5 days. Why Follow a Wheat Free Diet?